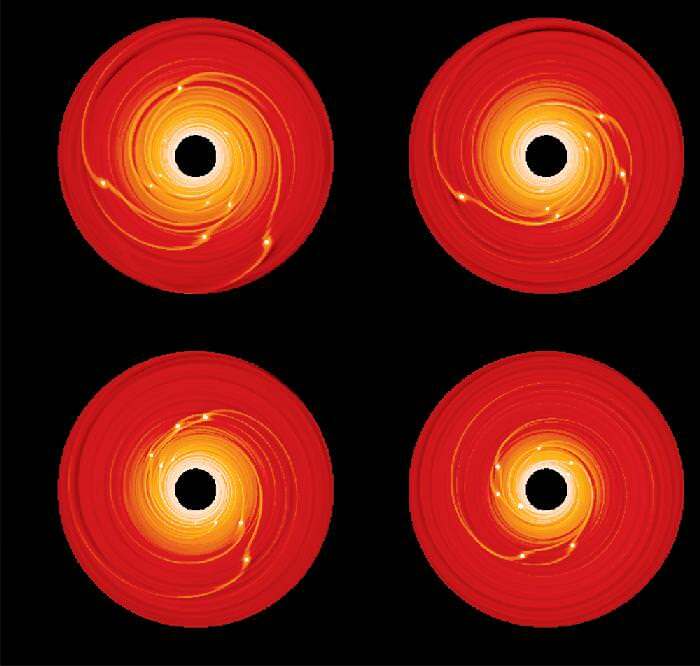 Astronomers think they’ve got a handle on many aspects of planetary formation. But two British researchers have discovered a problem with the formation of gas giant planets. Under their model, the cores of these massive planets should be drawn inward by their parent star in only 100,000 years – not nearly enough time to form into a stable orbit. It could be that the first generations of planets never get past the “clump” stage before they’re destroyed. It’s only the later generations that actually survive long enough to become planets. Two British astronomers, Paul Cresswell and Richard Nelson present new numerical simulations in the framework of the challenging studies of planetary system formation. They find that, in the early stages of planetary formation, giant protoplanets migrate inward in lockstep into the central star. Their results will soon be published in Astronomy & Astrophysics. The current picture of how planetary systems form is as follows: i) dust grains coagulate to form planetesimals of up to 1 km in diameter; ii) the runaway growth of planetesimals leads to the formation of ~100 ? 1000 km-sized planetary embryos; iii) these embryos grow in an “oligarchic” manner, where a few large bodies dominate the formation process, and accrete the surrounding and much smaller planetesimals. These “oligarchs” form terrestrial planets near the central star and planetary cores of ten terrestrial masses in the giant planet region beyond 3 astronomical units (AU).